Tiana Vandenberghe is a second-year plumbing apprentice employed with Bevan Bros. Limited Plumbing & Heating. 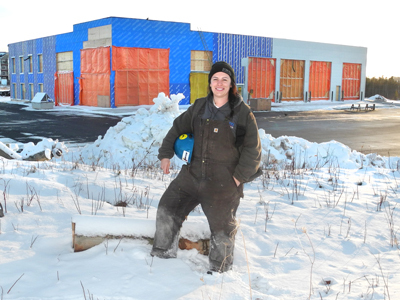 She is working on the new site of Seafood Express in Charlottetown. When Tiana Vandenberghe signed up for the plumbing program at Holland College, she did not have a lot of background in the trades. “I went into the program blind, but I was open to everything, and I was ready to dive in and make it work. “The summer before I decided to go back to school, my husband, his father, and I installed a wood boiler in our basement. I enjoyed the technicalities of the controls and soldering process. Tiana spoke to SkillsPEI, and was eligible to receive 70 percent of her tuition and was able to continue her EI while in post-secondary. The rest of the financing came from an RESP her mother had set up, which covered the cost of tools, books, and student fees. Tiana did her on-the-job training with a small residential plumbing company in Montague. The second opportunity was with the Plumbers & Pipefitters Union, which sent Tiana to work with Bevan Bros. Limited Plumbing & Heating. “The idea that the trades are not friendly to women workers is all wrong,” says Tiana. Tiana is a member of the Plumbers & Pipefitters Union. The high rate for first-year apprentices is $16.40/hr. In addition, for every hour worked, the employer contributes $6 to her pension plan with the Union. Dental and medical benefits are also included in the wage package. Union dues are $30 per week. For more about the Holland College Plumbing/Pipefitting program, visit www.hollandcollege.com and search plumbing / pipefitting. For more about the Plumbers & Pipefitters Union, call 902-894-5404 or visit Facebook.